Introducing Bloggify, A Responsive WordPress blog theme for bloggers with user friendly unique design and SEO optimization. We care about your site loading time, so we created this blog theme for loading fast and we’ve not used any heavy page builders that can kill your site performance. There are foud post formats to visualize your various types of post in a better way, such as standard post, music post, video post and gallery post. 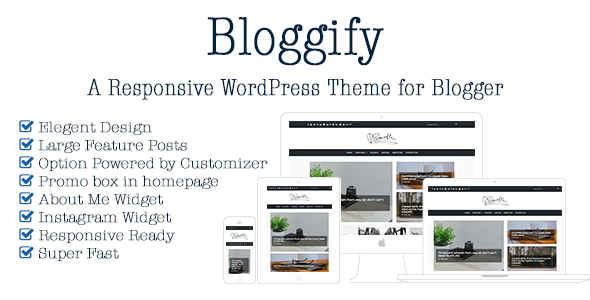 Bloggify will show you best performance from WordPress to take your blog next lavel. We’ve used native WordPress option manager called customizer and three widgets we’ve made for you to avoid third party plugins. We will update and bloggify regulary, so you will get update every time for free. Custom styling included for “MailChimp for WordPress” plugin to display newsletter widget.